Saturday was full of excitement at Balcom’s Cove, the condo complex that we live in. 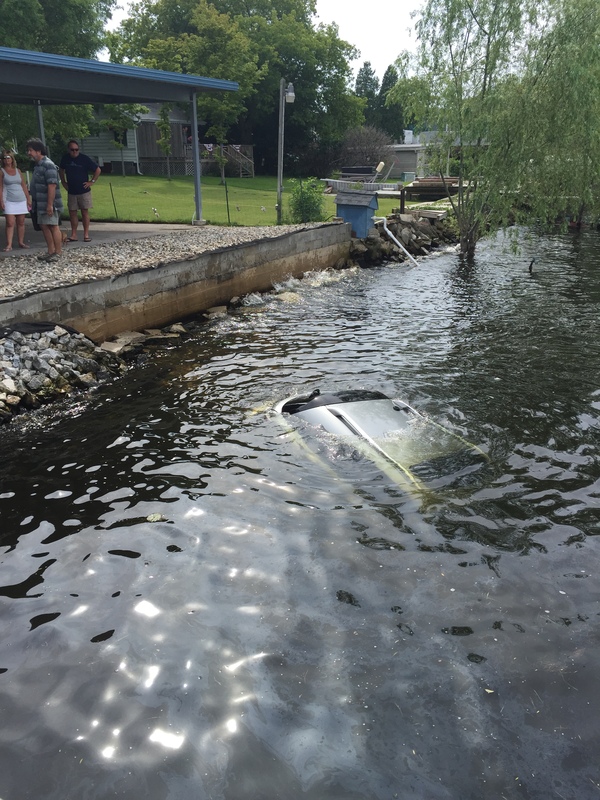 John, one of our neighbors, was parked by the marina and accidentally drove his SUV into Muskegon Lake. Our brother-in-law Luz was sitting on our balcony and heard the car go into the water. Mark and Luz immediately ran out to help while Kelly yelled to her husband Chris who luckily was already out by the lake. Chris immediately began sprinting toward the scene and jumped into the water once he was able to see what had happened. By the time Mark and Luz got down to the water Chris and Bryan were already in the lake trying to help John get out of his car. Chris said when he first reached the car the driver’s side window was open and there wasn’t very much water in the car. John had one leg out the window and was trying to get out so Chris and Bryan both tried to pull him out but it wasn’t working. As the car started to sink deeper into the water Chris went to try and gain entry through the back passenger window to free John from the other side while Bryan reached in and grabbed John’s other leg, braced his feet against the outside of the car and pulled John out of the car to safety just as John’s head became completely submerged in the water. Once the water started rushing in everything happened fast. Once John was out of the car Bryan and John held on to the roof of the car in order to catch their breath before swimming to shore, at which time the neighbors of Balcom’s Cove were able to help John back up to dry land. What quick thinkers! The neighbor is so lucky and blessed! Thanks for sharing, Rosemary! We saw Darrell White and he mentioned that he had visited with you. R-P’s Class of 1974 has some wonderful people in it, including you! By golly Rosemary, the hair on my arms was standing as I read the details! As I had already commented I thought Bryan and Chris heroes. But, hearing the difficulty in the whole scenario was as I said hair raising. Good people to be around in an emergency! Rosemary, that poor guy. I also follow your blog but have never commented. It’s easy so now I will comment more often. You are a brave woman to say the least and you have a wonder family. God bless you! Rosemary… Wow!! Quite the rescue!